South Korea has accused the North of blocking the return of 27 North Koreans who strayed across the border. The North has said Seoul is keeping hostage four North Koreans, from a boatload of 31 which drifted over the sea border in heavy fog on 5 February. 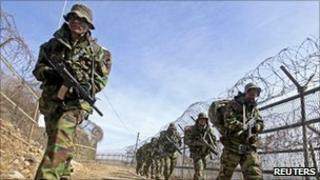 The refugee return row comes while South Korea is hosting large-scale military drills with the United States. Both North and South have called for talks to ease tensions; the last effort ended without agreement last month. South Korea's Unification Minister, Hyun In-taek, told parliament he was respecting the free will of the four people who had chosen to stay in the South. When South Korean officials took the 27 others to the Panmunjom border village there were no North Koreans prepared to accept the group, Seoul said. "We are still waiting for North Korea's response but we cannot wait forever," said a ministry spokeswoman Lee Jong-joo. Although tensions between the two countries, which are still technically at war, are not as high as at the end of last year, military talks early last month broke down on only the second day. Many analysts predict that the North will initiate another confrontation this year. This may be to burnish the military credentials of Kim Jong-il's youngest son, who's widely thought to be in line to succeed his ailing father as leader. It is also thought the North may want to ratchet up tensions to a point at which multilateral talks take place, so Pyongyang can extract economic and food aid in return for measures to calm relations. The situation is complicated by South Korea's refusal to offer any concessions to the North until it demonstrates a change in behaviour, including on denuclearisation. Previous governments in Seoul had been more willing give ground in disputes in order to reduce tensions. "We will make a decision if North Korea keeps silent," she told AFP. For its part, North Korea has accused the South of "despicable unethical acts". "This cannot be interpreted otherwise than a grave provocation to the DPRK (North Korea)," said a statement attributed to a spokesman for the North's Red Cross. This comes in the same week that North Korea threatened to turn the South's capital, Seoul, into a "sea of flames" because of large-scale military drills being carried out by US and South Korean forces. The joint command says the drills involving more than 200,000 troops as defensive - the North says they are a rehearsal for invasion to topple its communist government. Relations have been fraught since the North shelled a South Korean island in November, killing four people. The attack came just months after 46 sailors were killed when a South Korean warship was sunk. An international investigation blamed a North Korean torpedo attack but Pyongyang denies any involvement.